This is a new project that is basically a supergroup of sorts. It is formed by former members of Dio, Quiet Riot, Lynch Mob, and David Lee Roth’s band. You have Chas West on vocals, Jimmy Bain on bass, Vinny Appice on drums and Brian Young and Carlos Cavazo on guitar. I like this disk for 2 main reasons. First, it is only 8 songs and has a playing time of approximately 35 minutes. I like this because it doesn’t overstay its welcome with filler tracks. Too many of today's bands feel the need to fill all 80 minutes of a CD. It is much better to leave the listener wanting more than giving them too much. The other reason I really like this album is that it is rock music played at its purest form. There are no effects, just a bunch of musicians hammering out some great tunes. There is a little similarity to the type of rock that Alter Bridge churns out but I like this much better. Even though the members came from metal backgrounds, I would not classify this as a metal product because it does not really have a lot of the elements that you find in that genre. Chas West sings in a Paul Rodgers fashion instead of the screaming most of us associate with metal. This album has more in common with Badlands then it does with Judas Priest. 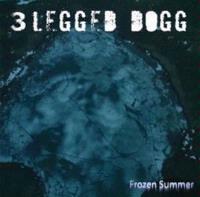 In today’s musical climate, 3 Legged Dogg is a breath of fresh air. I just hope this isn’t going to be their only release. The album starts off with this Alice In Chains/Alter Bridge hybrid. This is a very organic sounding rock tune. It’s just great rock played very pure without any studio trickery and it reminds me of all the great late 70’s rock. This track is very similar to the opening cut but it has a hint of southern rock thrown. It’s not there throughout the whole piece but I definitely hear elements in the vocals early on in the tune. Hands down, this is the best song on the record. It’s kind of a ballad but is not the type that comes to mind when using the word “ballad.” This is more the type of softer cut that Bad Company would throw in on an album. If radio was in a better state than it is today, “Rain On My Parade” would be all over classic rock stations. I would buy the CD on this track alone. You can hear more of the 80’s metal sound on this piece. The vocals still have the rock sound but it is a nice mix. There is also a nice little bridge right after the guitar solo that adds that little bit extra to the cut. In keeping with that 70’s sound, “Wasted Life” has an early Aerosmith feel. It is slightly more rocking than the other tracks on offer here but it fits in nicely giving the listener some variety. I also like the guitar/harmonica dual during the solo. This is the oddest sounding song on the CD. It has some 80’s metal in there but it also has newer metal thrown in. There is even early Black Sabbath added during the bridge. Again, the band brings something different to the mix to keep fresh. The Aerosmith sound comes in again during the verses but the rest of the tune has more of that Bad Company signature sound. With only 8 tracks here, it is hard to pick favorites, but this cut has to be in the top 3. Chas West sings this like Layne Staley from Alice In Chains. Even the guitar sound is fuzzy and has a “Man In The Box” feel. Parts of this tune sound so raw that you could mistake it for a demo. The chorus is unique to the record because West uses two different vocals that play off one another.